Not to be confused with Bolnisi cross. A cross pattée (or "cross patty" or "cross Pate", known also as "cross formée/formy" or croix pattée) is a type of Christian cross, which has arms narrow at the centre, and often flared in a curve or straight line shape, to be broader at the perimeter. The form appears very early in medieval art, for example in a metalwork treasure binding given to Monza Cathedral by Queen Theodelinda (d. 628), and the 8th century lower cover of the Lindau Gospels in the Morgan Library. An early English example from the start of the age of heraldry proper (i.e. about 1200) is found in the arms of Baron Berkeley. The word pattée is a French adjective in the feminine form used in its full context as la croix pattée, meaning literally "footed cross", from the noun patte, meaning foot, generally that of an animal. The cross has 4 splayed feet, each akin to the foot, for example, of a chalice or candelabrum. In German it is called Tatzenkreuz from Tatze, foot, paw. Planché provides a dubious suggestion that the term comes from the Latin verb pateo, to lie open, be spread. He states it to be discernible on the standard of King Stephen (1135–1154). A cross pattée with a sharp point added to the lower limb, as if for use in staking into the ground. Bolnisi cross, official national symbol of the republic of Georgia, used on flag, coat of arms and various official and unofficial organizations of this country. Many crowns worn by monarchs have jewelled crosses pattées mounted atop the band. Most crowns possess at least four such crosses, from which the half arches rise. Some crowns are designed so that the half-arches can be detached, allowing the circlet to be worn separately on occasion. A cross pattée is particularly associated with crowns in Christian countries. It is often heavily jewelled, with diamonds and precious stones. The Koh-i-Noor diamond is set in a cross pattée on the Crown of Queen Elizabeth (Elizabeth Bowes-Lyon). The British Imperial State Crown has a base of four crosses pattée alternating with four fleurs-de-lis. A cross pattée on the Imperial State Crown holds the Black Prince's Ruby. The cross pattée also features in many of the other British Crowns including the St Edward's Crown, used for coronations, and the Imperial Crown of India created for George V as Emperor of India to wear at the Delhi Durbar of 1911. The cross pattée is sometimes[by whom? ][year needed] associated with another Crusader order, the Knights Templar, though as with the Teutonic Knights, it was not used consistently. The Templars did adopt a red cross on their white robes in 1147, but there was no specific style designated. The cross patty variant does appear in the context of the Knights Templar towards the very end of the order's existence, in the late-13th-century frescoes at San Bevignate, Perugia. Modern Freemasonry adopted Templar symbolism, and some organisations use the red cross patty as representing the Knights Templar.. This cross is often associated with the Crusades. The heraldic cross pattée was sometimes used by the Teutonic Knights, a Crusader order, though their more usual emblem was a plain straight black cross on white,. In 1813, King Frederick William III of Prussia established the Iron Cross as a decoration for military valor. It remained in use as a military decoration, in various forms, by Prussia and later Germany until 1945. Prussian and German Imperial Landwehr and Landsturm troops used a Cross Pattée cap badge to distinguish them from regular army troops. 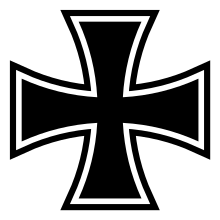 A stylized version of the Cross Pattée is used by the modern German military (Bundeswehr) as its symbol of nationality, and is found on vehicles, aircraft and publications, with no border of any kind at the ends of each arm, much like the March/April 1918-May 1945 Balkenkreuz used. The Bolnisi cross (Georgian: ბოლნისის ჯვარი bolnisis ǰvari) is a cross symbol, taken from a 5th-century ornament at the Bolnisi Sioni church, which came to be used as one of the oldest national symbol of Georgia. It is used on the flag and coat of arms of the Republic of Georgia as well as by various organizations and administrative divisions. Bolnisi Sioni inscriptions. Oldest Georgian inscription that uses the Asomtavruli script, predating the modern Mkhedruli script, inside Georgia. The Montenegrin cross-flag (Krstaš-barjak) has been used in Montenegro since medieval times to represent the state, and lately its military divisions. The earliest documented use of this flag has been recorded in 1687. [better source needed] During the 1990s, it has been used as a symbol of Montenegrin independence movement, most notably by the Liberal Alliance of Montenegro. Nowadays, Montenegro's Royal Capital City Cetinje uses krstaš flag as its flag. It is also used as an unofficial alternate Montenegrin flag, as well as by local trademarks and societies related to Montenegro. Montenegrin flag used in the Battle of Vučji Do, damaged by Ottoman soldiers' bullets. The Н.I. initials indicate Prince Nicholas I. One of the most important historical Montenegrin flags. The cross pattée is also placed before the name of the bishop who issues a Catholic imprimatur, and is occasionally found as a map symbol indicating the location of a Christian site. The Knights of Columbus, designed in 1883, and called a "cross formée"
It is also associated with the Alpha Tau Omega Fraternity. Derivatives of the cross pattée are popular amongst bikers, surfers, hot rodders and metalheads. Firefighters, especially in the United States, commonly use a version with triangular arms for patches and medals, though the cross pattée and the cross of St. Florian are both commonly mistaken for the Maltese cross. The cross pattée is used on the Marksmanship Badge in the United States Army, and United States Marine Corps. He-Man has a Cross pattée on his chest. In Unicode, a Cross pattée character is encoded under the name "Maltese Cross" in the Dingbats range at code point U+2720 (✠). The character "X" is rendered as a cross pattée in the Microsoft Wingdings font. ^ Cetinje, Official website (English). "Symbols". Retrieved 18 April 2014. Wikimedia Commons has media related to Cross pattée. 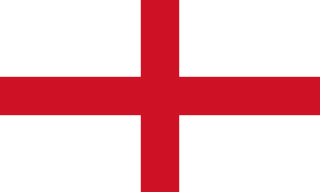 In heraldry, Saint George's Cross, also called the Cross of Saint George, is a red cross on a white background, which from the Late Middle Ages became associated with Saint George, the military saint, often depicted as a crusader. The flag of Montenegro was officially adopted with the Law on the state symbols and the statehood day of Montenegro on 13 July 2004 at the proposal of the government of Montenegro. It was constitutionally sanctioned with the proclamation of the Constitution on 22 October 2007. It is a red banner with broader golden edges all around the red field with the coat of arms of Montenegro in its center. The Maltese cross is a cross symbol, consisting of four "V" or arrowhead shaped concave quadrilaterals converging at a central vertex at right angles, two tips pointing outward symmetrically. Crown Prince Nicholas of Montenegro is the Head of the House of Petrović-Njegoš, which reigned over Montenegro from 1696 to 1766 and again from 1782 to 1918. The Montenegrin cap is a cap traditionally worn in Montenegro by the Montenegrins and Serbs of Montenegro. The Order of Christ Cross, frequently simply referred as the Christ Cross, is the emblem of the historical Portuguese Order of Christ and of Papal branch of the same Order. Later, it also become the emblem of the Brazilian branch of the Order of Christ. The coat of arms of Montenegro was officially adopted by the law passed in the Parliament on 12 July 2004. It is now the central motif of the flag of Montenegro, as well as the coat of arms of the Army of Montenegro. It was constitutionally sanctioned by the Constitution proclaimed on 2 October 2007. 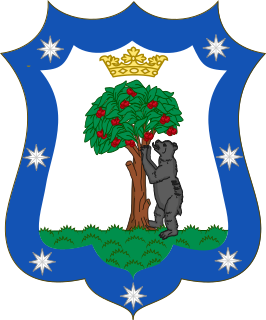 The coat of arms of Portugal is the main heraldic insignia of Portugal. The present model was officially adopted on 30 June 1911, along with the present model of the Flag of Portugal. It is based on the coat of arms used by the Portuguese Kingdom since the Middle Ages. The coat of arms of Portugal is popularly referred as the Quinas. Portuguese heraldry encompasses the modern and historic traditions of heraldry in Portugal and the Portuguese Empire. Portuguese heraldry is part of the larger Iberian tradition of heraldry, one of the major schools of heraldic tradition, and grants coats of arms to individuals, cities, Portuguese colonies, and other institutions. Heraldry has been practiced in Portugal at least since the 11th century, however it only became standardized and popularized in the 16th century, during the reign of King Manuel I of Portugal, who created the first heraldic ordinances in the country. Like in other Iberian heraldic traditions, the use of quartering and augmentations of honor is highly representative of Portuguese heraldry, but unlike in any other Iberian traditions, the use of heraldic crests is highly popular. In heraldry and heraldic vexillology, a blazon is a formal description of a coat of arms, flag or similar emblem, from which the reader can reconstruct the appropriate image. The verb to blazon means to create such a description. The visual depiction of a coat of arms or flag has traditionally had considerable latitude in design, but a verbal blazon specifies the essentially distinctive elements. A coat of arms or flag is therefore primarily defined not by a picture but rather by the wording of its blazon. Blazon also refers to the specialized language in which a blazon is written, and, as a verb, to the act of writing such a description. This language has its own vocabulary, grammar and syntax, which becomes essential for comprehension when blazoning a complex coat of arms. The coat of arms of Wallis and Futuna consists of elements from the unofficial flag of Wallis and Futuna featuring a red saltire on a white square, which in turn is placed on a red field. The cross is placed on the lower right; the flag of France outlined in white on two sides is in the upper left quadrant. The bear as heraldic charge is not as widely used as the lion, boar or other beasts. The coat of arms of the Valencian Community is the official emblem of the self-government institutions of the Valencian Community. It is based on the armorial achievement used from the reign of King Peter IV to John II, called the Great. In 1978 the former Council of the Valencian Country approved it “...for being the oldest known representative emblem of the former Kingdom of Valencia, that had located on the Xerea Gate of the city of Valencia”. The emblem of Yugoslavia featured six torches, surrounded by wheat with a red star at its top, and burning together in one flame; this represented the brotherhood and unity of the six federal republics forming Yugoslavia: Serbia, Croatia, Bosnia and Herzegovina, Slovenia, Montenegro, and Macedonia. The date imprinted was 29 November 1943, the day the Anti-Fascist Council for the National Liberation of Yugoslavia (AVNOJ) met in Jajce on its second meeting and formed the basis for post-war organisation of the country, establishing a federal republic. This day was celebrated as Republic Day after the establishment of the republic. The emblem of Yugoslavia, along with those of its constituent republics, are an example of socialist heraldry. The Bolnisi cross is a cross symbol, taken from a 5th-century ornament at the Bolnisi Sioni church, which came to be used as a national symbol of Georgia. The Sceptre of the Armillary, also known as the Sceptre of the United Kingdom of Portugal, Brazil, and the Algarves, is a piece of the Portuguese Crown Jewels, originally created for the acclamation of King João VI, alongside the Crown of João VI and the Mantle of João VI. The flag and coat of arms of the Sovereign Military Order of Malta display a white cross on a red field, ultimately derived from the design worn by the Knights Hospitaller during the Crusades. The krstaš-barjak refers to various war flags with crosses in the centre, part of Montenegro tradition, originating from medieval military flags. It is known that Serbian Emperor Stefan Dušan adopted the Byzantine cross flag. According to Serbian epic poetry, during the Ottoman period, hajduks had war flags with crosses (krstaš-barjak) or icons of saints. The krstaš-barjak is mentioned in poems of the Kosovo Cycle; knight Boško Jugović bears it at the battle of Kosovo (1389). It was used as the general rebel flag during the Serbian Revolution (1804–17), and as the secondary flag of the supreme commander. It was adopted as a military flag by the Principality of Montenegro (1852–1910) and Kingdom of Montenegro (1910–1918). The Montenegrin war flag used in the Battle of Vučji Do (1876) was red with a white cross pattée in the center and a white border, and tradition holds that it was adopted from the war flag of Kosovo which found itself in Montenegro after surviving knights brought it there. In Peroj, it is held that their ancestors had a war flag used at Kosovo in their possession. The coat of arms of the city of Gdańsk, in its current form, dates back to 1410 and Banderia Prutenorum. The coat of arms is very similar to the flag of Gdańsk. It depicts two silver crosses on a red shield above each other, above which hovers a golden crown. The greater arms also has two lions as supporters and Gdańsk motto.